Downtown's new Freehand Hotel opened on June 22nd, the third outpost in the mini-chain after locations in Miami and Chicago. 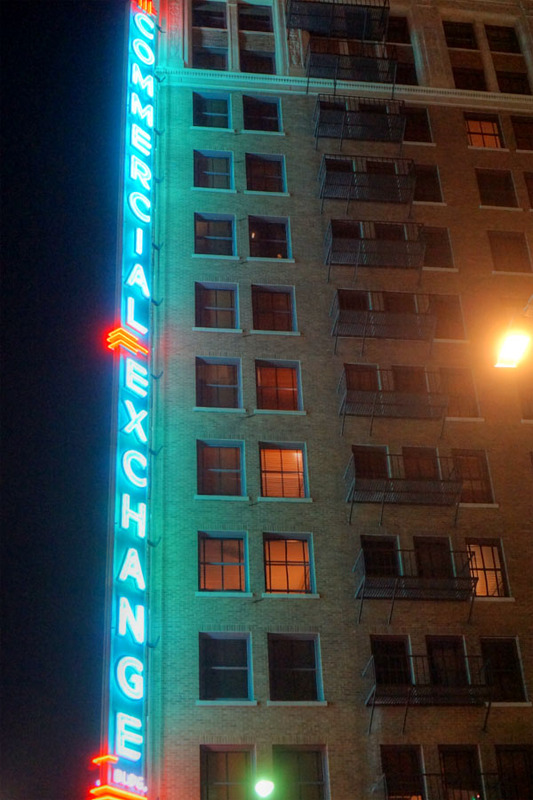 Housed in the historic Commercial Exchange Building, the Freehand was brought to us by the Sydell Group, the firm also in charge of the NoMad and The Line brands. 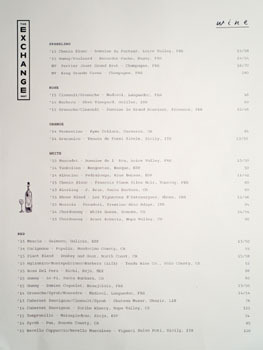 Along with the hotel's opening came the debut of The Exchange, the property's signature restaurant. 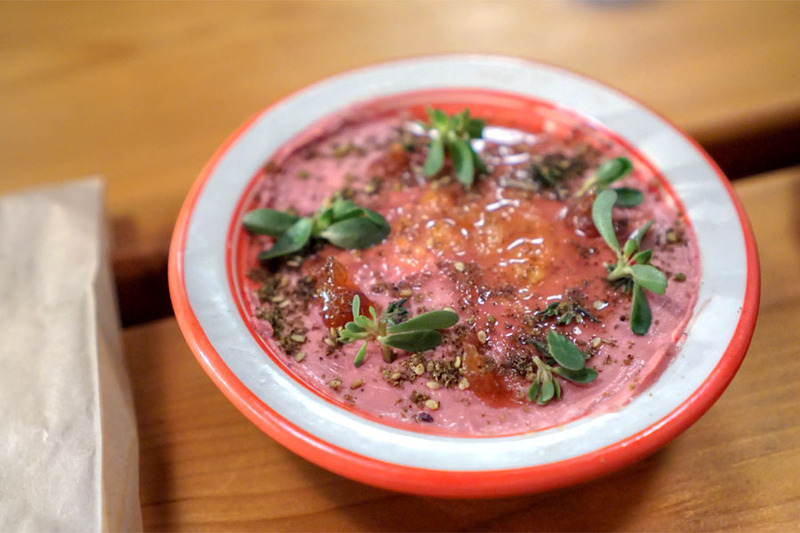 It's the work of hospitality consulting firm Bar Lab, along with Chef/Partner Alex Chang, who's presenting his take on vegetable-centric Cal-Israeli cuisine. About the Chef: Chang was born in Hong Kong to a Chinese father and Mexican mother, but was raised in the Santa Barbara area. His father moved to Tokyo when he was 12, leaving him with his mom and older sister. When his sister went to college his senior year of high school, he was often home alone, and thus started experimenting in the kitchen via a Rachael Ray cookbook. Chang eventually enrolled at USC (majoring in kinesthesiology), moved to LA proper, and really began exploring the City from a culinary perspective. Around late 2009, he and roommate Robert Kronfli (a music major whose brother Daniel ran Bacaro LA) began cooking dinners for friends out of their apartment. At first, these meals featured simple, homey type dishes. 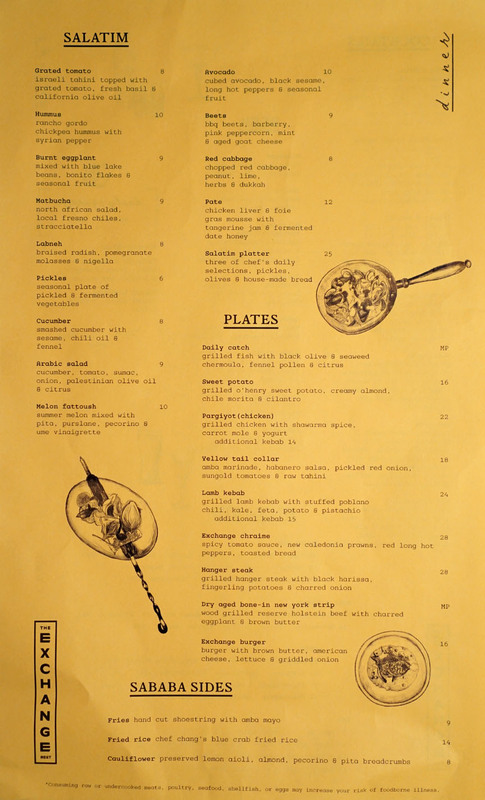 As things progressed though, the cooking became more complicated, and they started charging a nominal fee ($15) for the dinner series, which became known as Paladar (named after similar such supper clubs in Cuba). By the end of it, Paladar was serving 60 people a night, and was even chronicled in a documentary by USC film student Gil Freston (shown at both the Tribeca Film Festival and Downtown Film Festival Los Angeles in 2013). 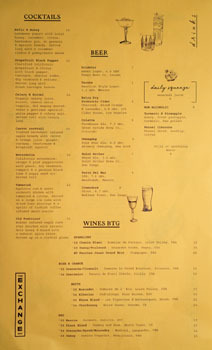 Chang graduated in 2011 and found a gig at Lazy Ox Canteen, which at the time was still under the watch of Josef Centeno. After about a year, he moved to Tokyo to live with his father, during which time he staged at Yoshihiro Narisawa's eponymous restaurant. He then returned Stateside and cooked for two years at Animal, under mentor Jonathan Whitener. Around this time there were still Paladar dinners, but they were few and far between. 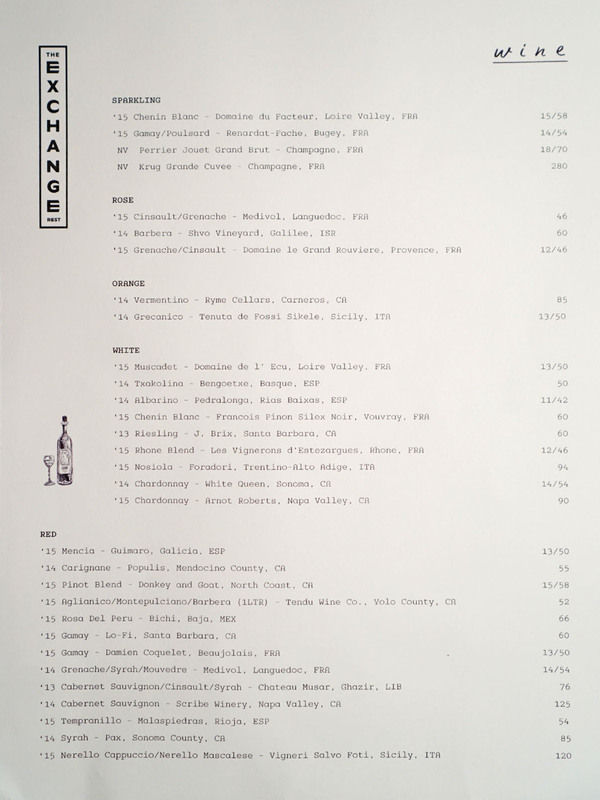 This was followed by stages at Enrique Olvera's Pujol and Jorge Vallejo's Quintonil, as well as at Belgium's In De Wulf. 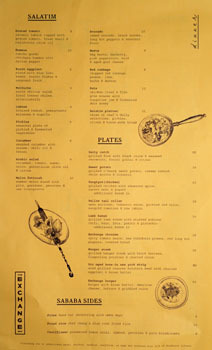 Chang's next move was to Miami, where, at the request of restaurateur Alvaro Perez Miranda (who'd seen the Paladar film), he opened Vagabond at the start of 2015. 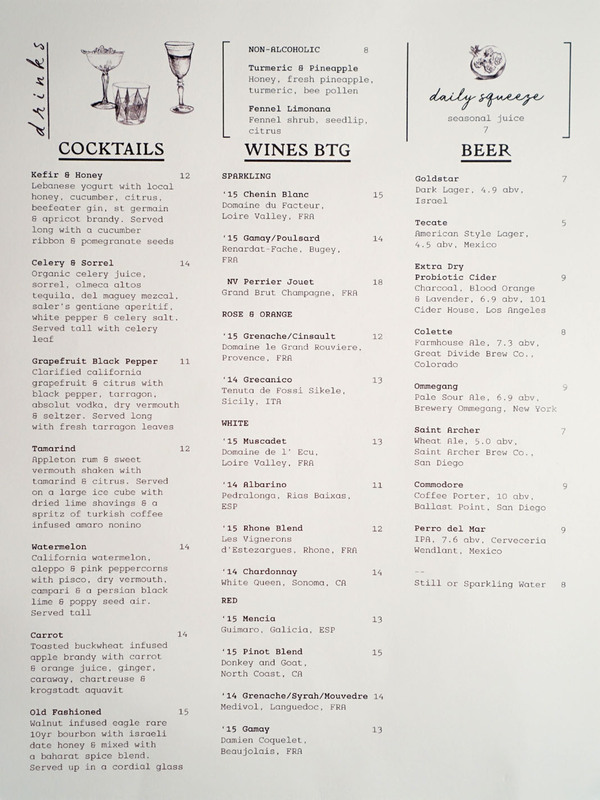 It was also in Miami where he met Gabe Orta and Elad Zvi from Bar Lab, and the two wound up convincing him to leave Vagabond in July 2016 to start work on The Exchange. Note that Portland's Jenn Louis was originally slated to run the eatery at the Freehand, but those plans obviously fell through. The bi-level restaurant (and indeed, the entire hotel) was designed by NYC-based firm Roman & Williams. It has a sort of loose, casual Craftsman-y feel, with lots of honey-hued wood and deep blue-greens. Of particular note are the muslin-swathed light fixtures, which were inspired by kites. Chang's Mideast menu is split up into sections for salatim (cold appetizers), larger plates, and sababa ("awesome") sides. And since this is a hotel restaurant, there are also separate lunch and brunch options. 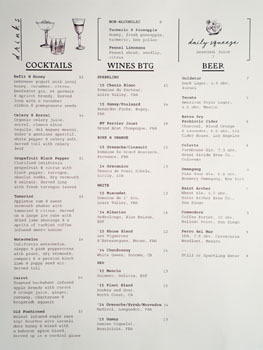 Drink-wise, we have a short-but-appealing list of cocktails, eight beers, and a compact wine list with some interesting selections. Click for larger versions. We were able to try a few of the cocktails tonight, and the first ended up as one of my favorites. 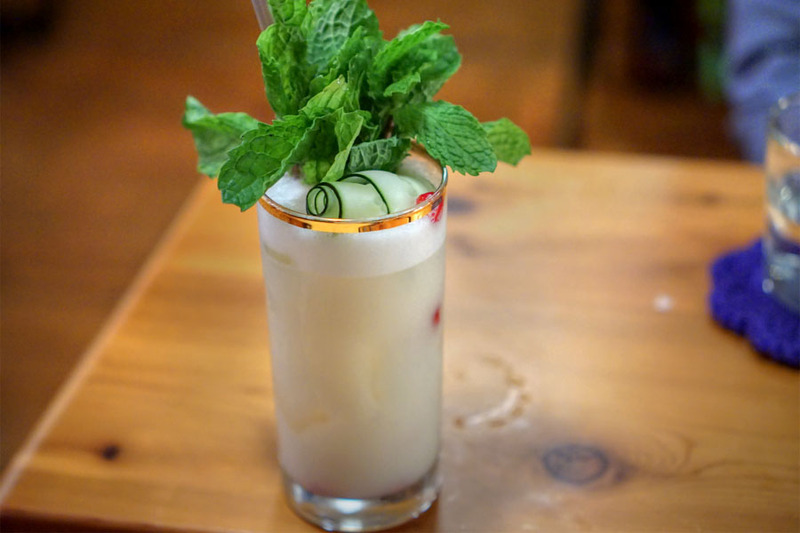 The drink had really appealing aromas of pungent citrus and sweet spice, while its palate was smooth, soft, with more fruity, citric character leading to tangy notes of tamarind on the back end. 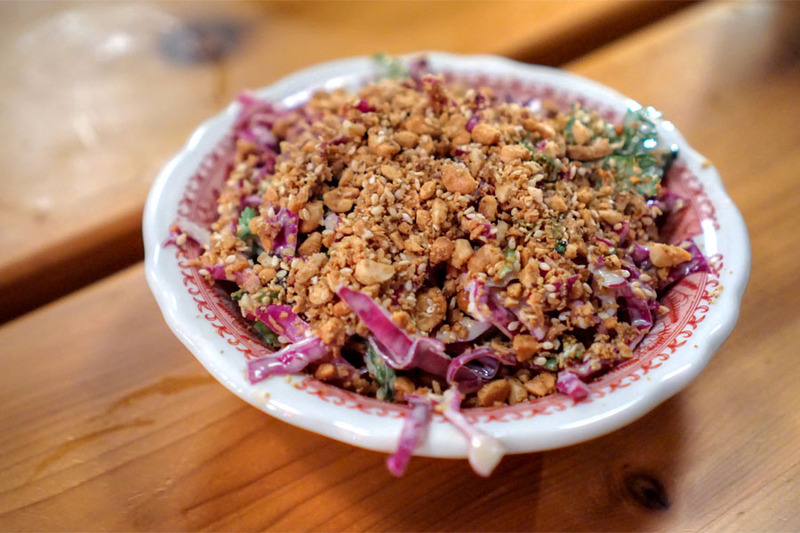 Our first of five salatim was the Chef's take on the salatat bandura. It was classic at its core, a juicy, bright, satisfyingly-textured dish brought together by the olive oil. 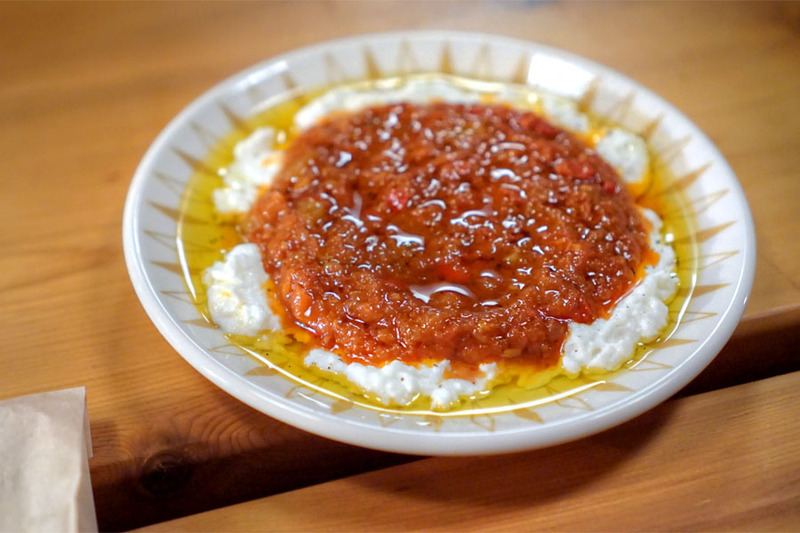 The matbukha did a great job meshing a heavy helping of smoky-sweet-sour pepper with the cool, lush nature of the cheese. The best part? A growing, creeping heat that was a pleasant surprise. 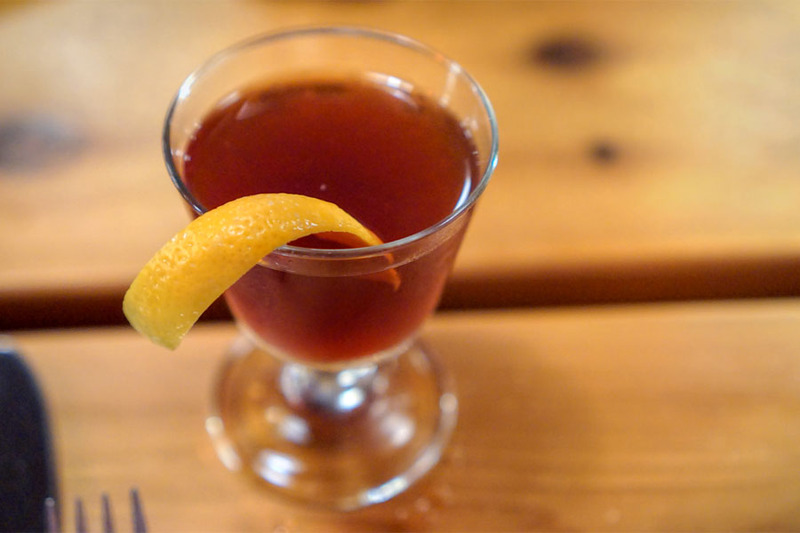 This easy-drinking cocktail was a table favorite with its tangy, lactic character and underlying notes of fruit and honey. 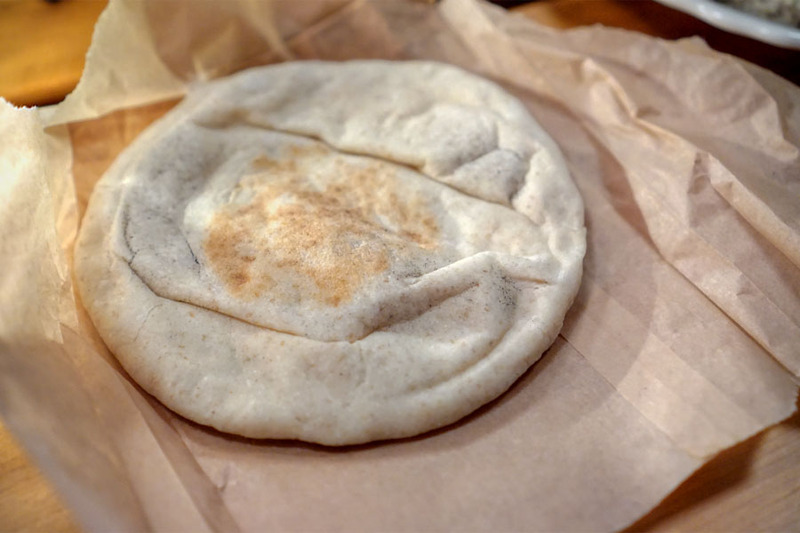 I thoroughly enjoyed the housemade flatbread, which I found particularly "fluffy." Chang's pâté was on point, coming out smooth and spreadable, with a healthy dose of earthy, liver-y goodness evened out by a sour-sweetness from the jam 'n' honey. Especially good when taken with the pita above. This was surely the booziest of our cocktails. Nose of dark fruit, citrus, and spice, with a bitter edge. Taste-wise, think bittersweet, somewhat astringent, with a bit of alcoholic heat and the walnut really making itself known toward the finish. 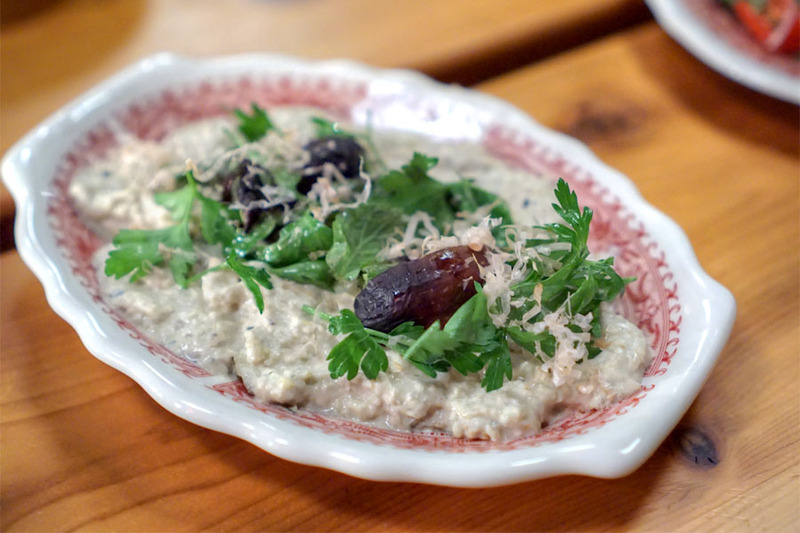 A reworked baba ghanoush was a standout, and easily one of the best versions I've had of the dish. The eggplant was smooth and smoky, well-integrated with its base of tahini and superbly balanced out by all the greenery up top. Great counterpoint from the beans, too. Our final starter was my favorite of the fivesome. I loved the light, bright crunch of the cabbage here. 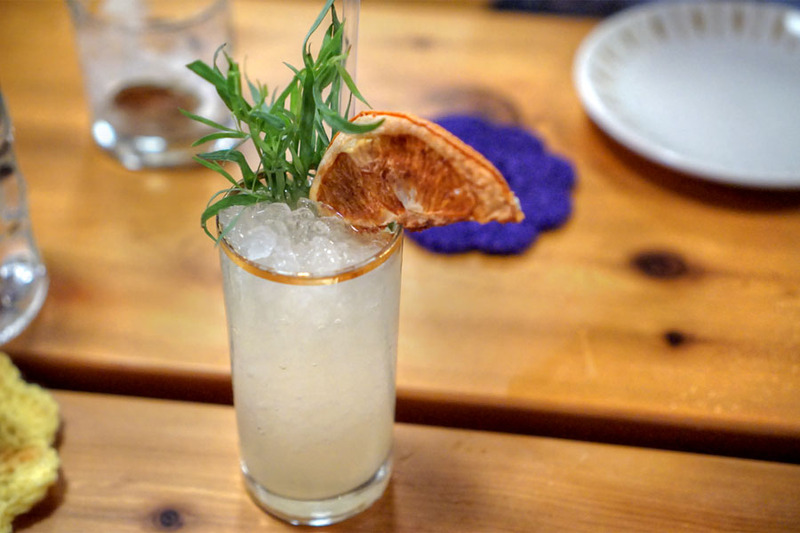 It just worked with the peanuts, herbs, and pricks of lime while the creamy, nutty duqqa bound all the elements together. 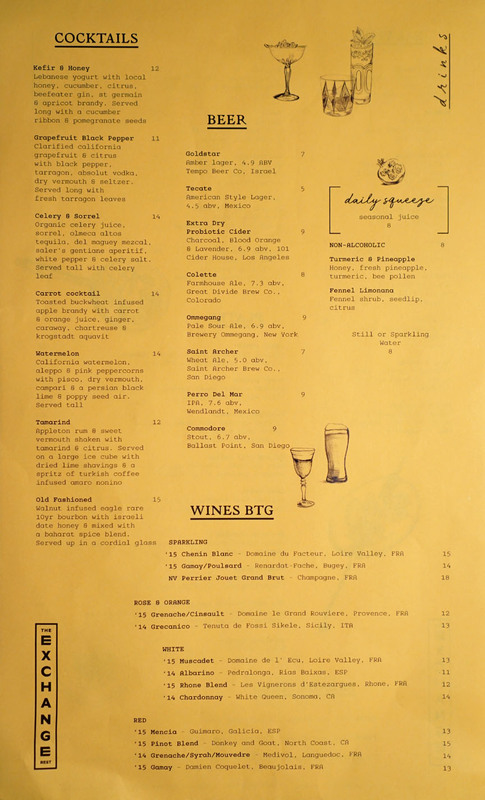 A spot on commingling of disparate tastes and textures. 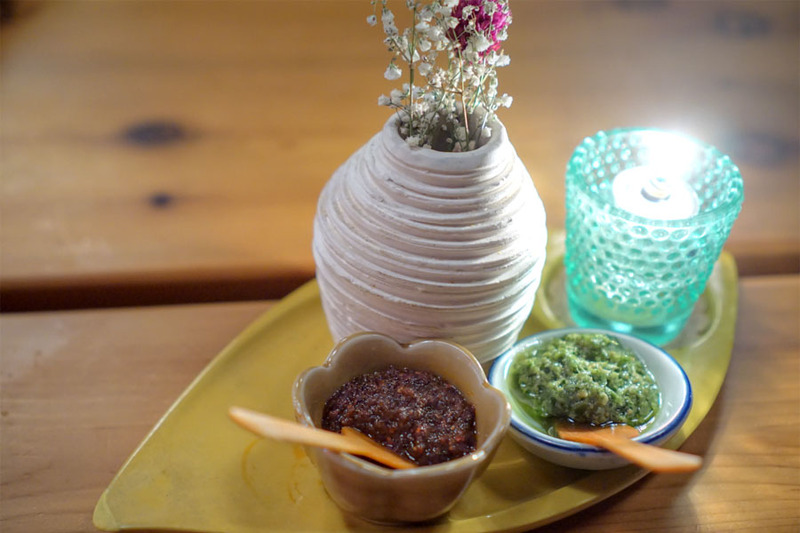 On the table were two homemade condiments: a smoky, salty, spicy harissa featuring Aleppo pepper and cumin; and a stupendous serrano-based zhug, which had some super focused, complex, vegetal, piquant flavors that kept me going back for more. 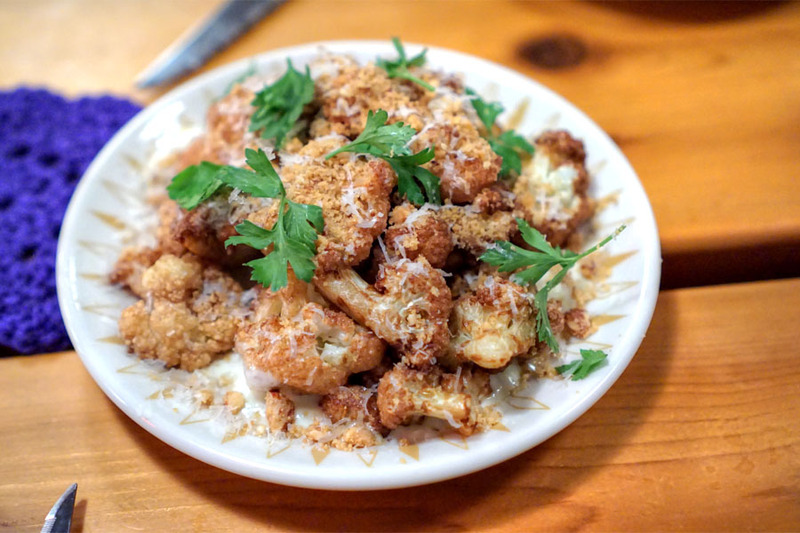 Given my penchant for cauliflower, I had to get this dish, and it turned out to be another highlight. I loved the crispness of the veggie as well as its char, while the back-and-forth between the salty cheese and tangy aioli was a perfect complement. One of the best preparations I've had in a while. 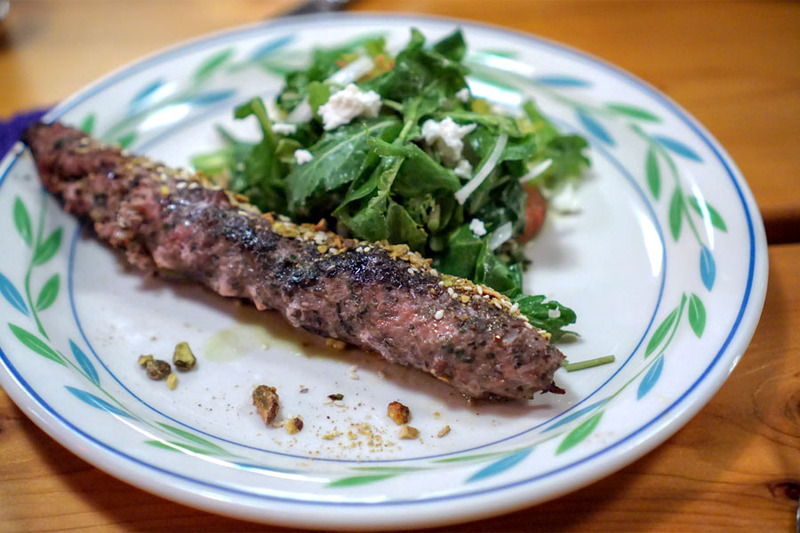 Grilled lamb arrived well-seasoned and brimming with cozy, almost meatloaf-y flavors. It was tasty to be sure, but was actually outshone by the salad, which had a sharp, piercing heat that was balanced out by the feta and potato. A wonderful chile relleno added even more interest. 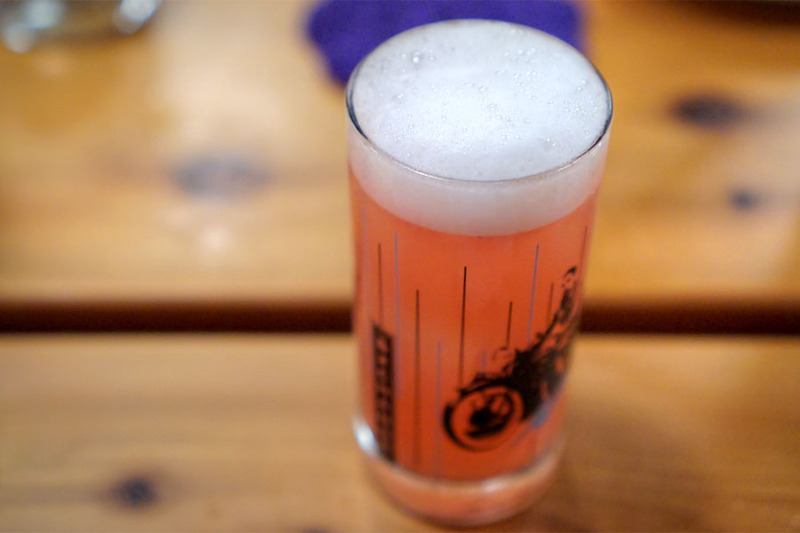 Our next cocktail showed off sweet, refreshing, true-to-life notes of watermelon perked up by a bit of herb and tartness. 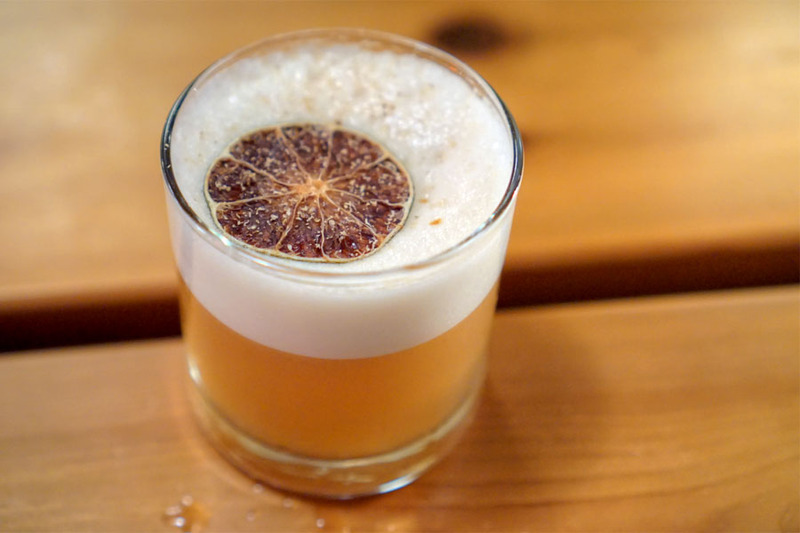 The most interesting element, though, was that warm, spicy, multifaceted foam on top. 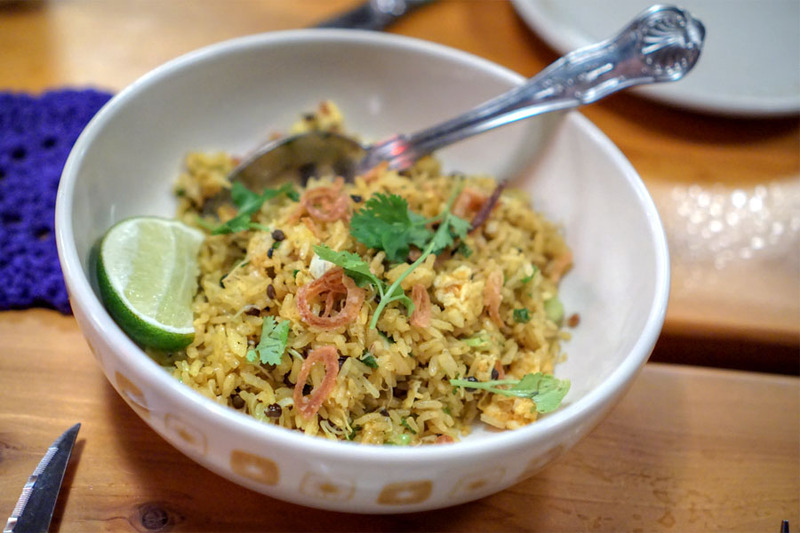 The fried rice was another favorite, showcasing old school flavors but with an extra dosing of brine and umami from the crab. I wanted a bigger bowl of the stuff! Tonight's pièce de résistance was an off-menu special. 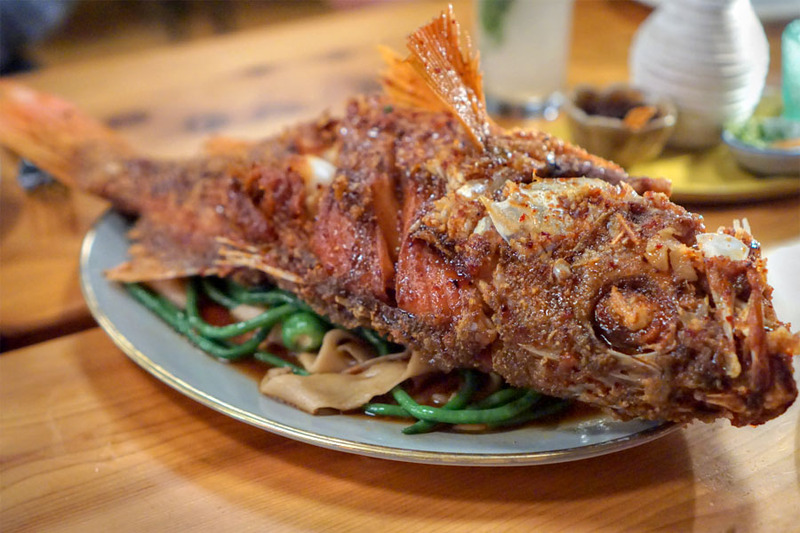 The fish was red snapper-like, with soft, sweet, meaty-yet-flaky flesh that worked beautifully with its crispy skin. I got a blast of sweet 'n' sour that took the dish in a sort of nostalgic Chinese-y direction, a nod to the Chef's heritage perhaps. Long beans served as a contrast to the fish, as did the peppers, though the hand-pulled noodles were on the overly chewy side. The night's final cocktail brought a plethora of spicy, peppery, herby nuances at first blush, which then transitioned to the advertised bittersweet grapefruit. This one also went down easy. 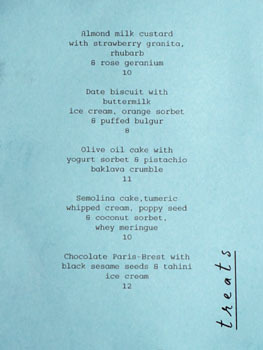 For dessert you'll find four theme-appropriate selections. 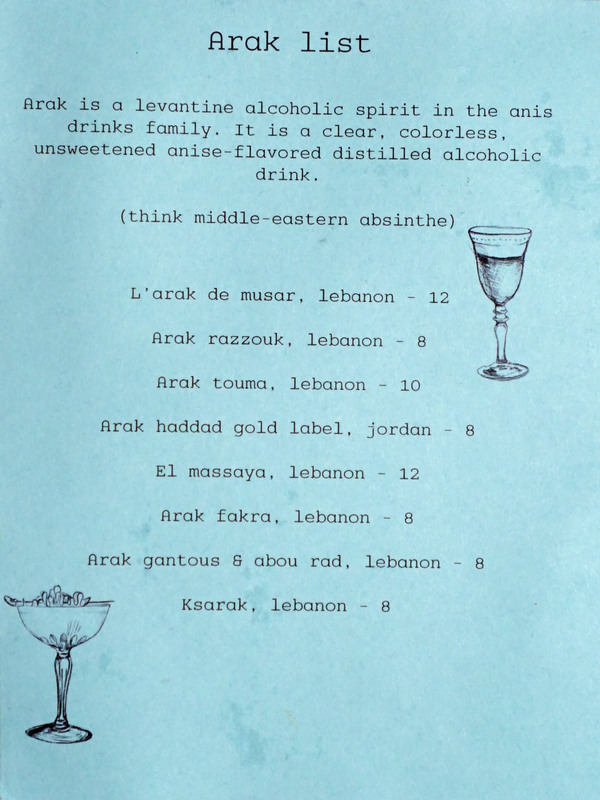 There's also an arak list, which I don't think I'd ever encountered before. Click for larger versions. 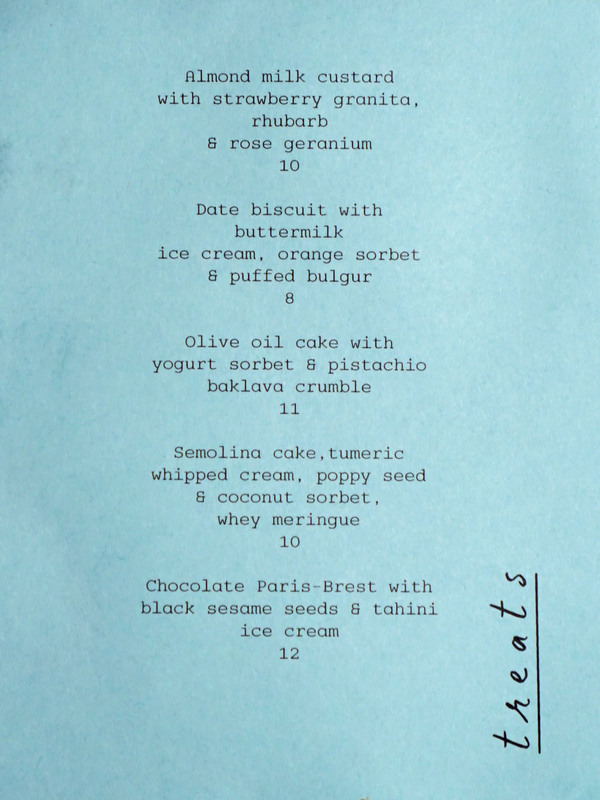 The kitchen ended up sending out our first two desserts on the house. 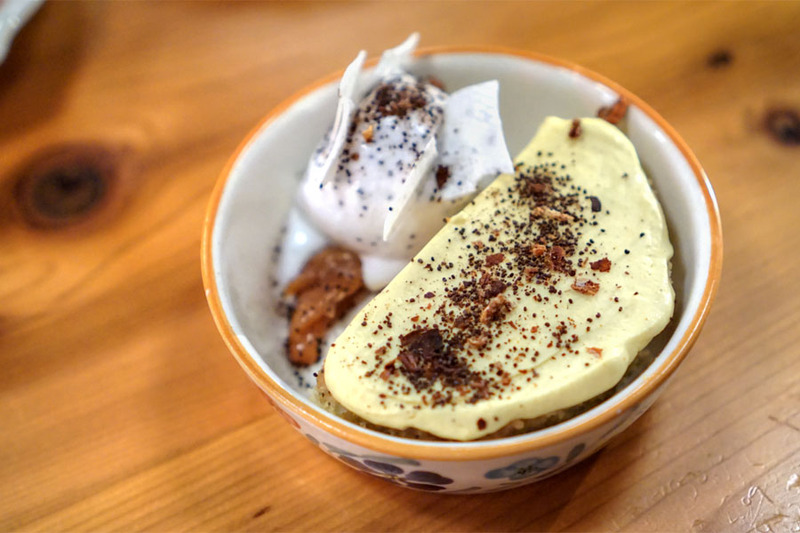 A date biscuit showed off a delightfully crumbly texture, its subdued sweetness well-matched to the super tart sorbet and nutty crunch of bulgur. The semolina cake I found dense, moist, conveying an almost coconut-like sweetness that suited its turmeric-enriched topping. 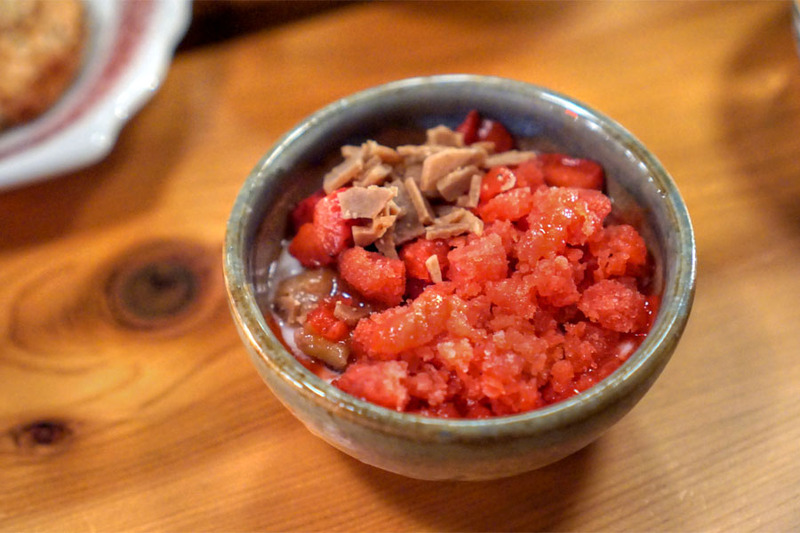 Even better, though, was the sorbet-meringue combo on the side, which definitely had a punchiness to it. 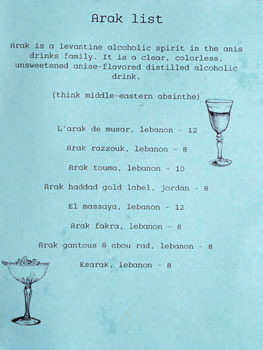 The L'arak de musar, lebanon [$12] served as our after-dinner libation. 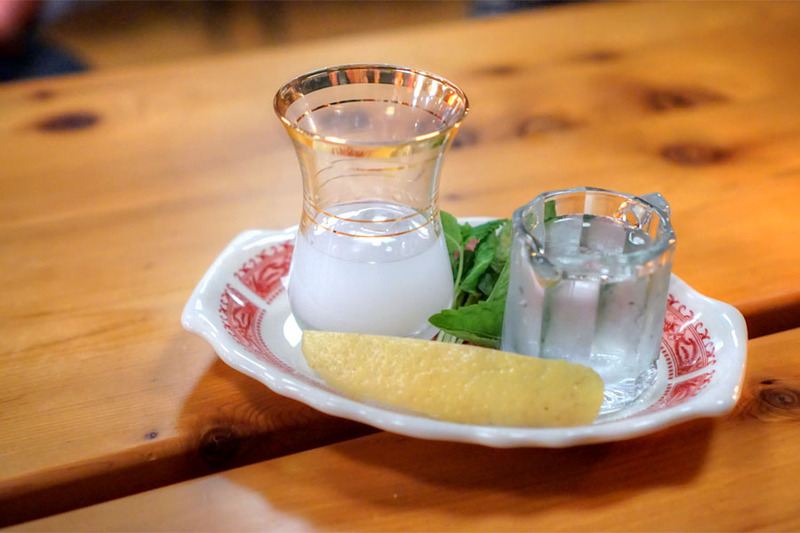 It had a sambuca-like aroma filled with anise, unsurprisingly. 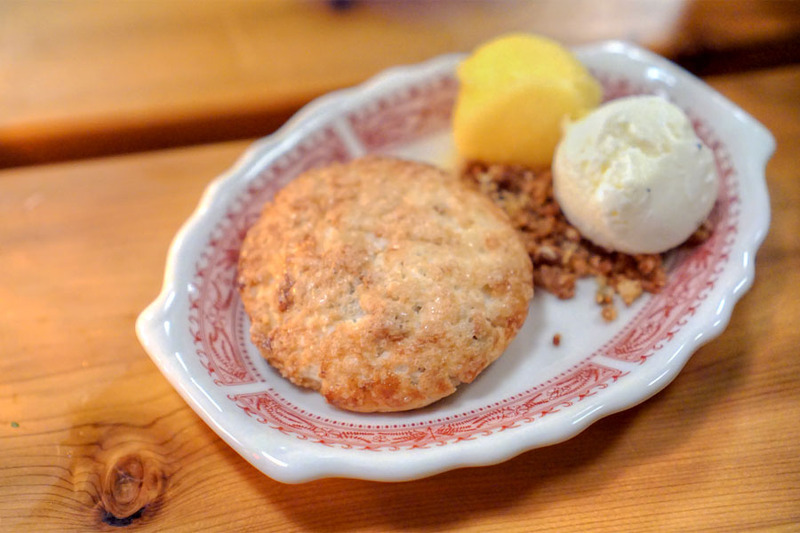 The taste brought tart aniseed flavors at first, which led to a growing sweetness and slight minty quality. The sole vegan dessert was superb, bringing forth a bevy of super sweet, floral, fruity flavors that were moderated by the creamy custard. Great crispy bits up top, too. 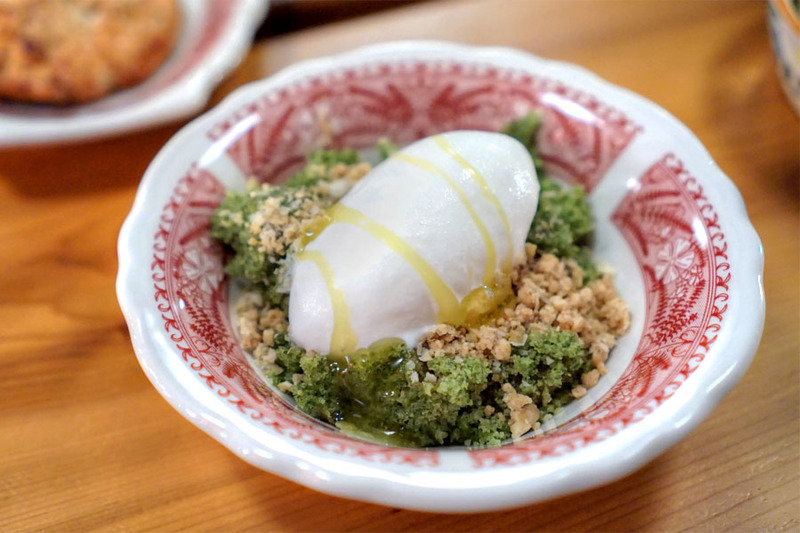 Last up was this savory-sweet, slightly herbaceous olive oil cake, which paired effortlessly with the nutty crumbs, airy sorbet, and subtle minty notes in the dessert. A lovely conclusion. 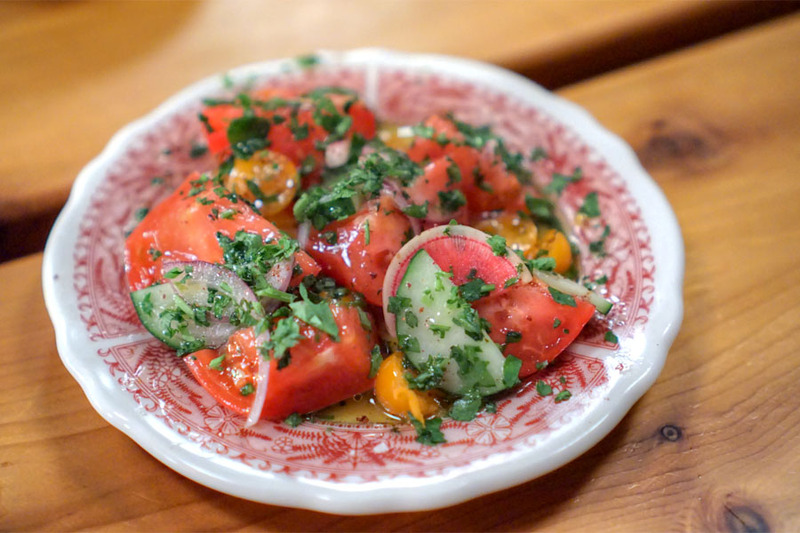 Our meal at The Exchange was a strong one, and I have to say that this was some of the tastiest Levantine fare I've had in recent times. The food balances tradition and modernity, with flavors that invoke Los Angeles almost as much as they do Tel Aviv. I really like what Chang is doing here, sort of blending the usual Middle Eastern tropes with his own multicultural upbringing and making for a fun and delicious eating experience in the process. After dinner, we headed up to the roof to check out Broken Shaker, though we didn't stay for any drinks (there were no seats available). Nice view though. "I wanted a bigger bowl of the stuff!" Then order another, you baby. Broken Shaker. Not Broker Shaker. The highlight of the meal was the view at the end of the night. Car parking is an exhaustive task to do and it is really difficult to get the same here in Vilnius. This problem will sustain until you are not aware of the Autonuoma (car park) services of Turbonuoma. Whether you have a tiny or a big car, we have a place for all and you will be happy with the amenities that we offer. Plus the rates will be very much reasonable. So, don’t wait and get the parking spot by reaching us at www.turbonuoma.it.